the scent of green bananas: recipe: turkey tinaktak. Posted by santos. This entry was posted on 20061111 at 12:32 AM You can skip to the end and leave a response. mmmm... sounds really good. How different are the long beans from regular green beans? hi cathy! tastewise, they are similar. texturally the long beans seem drier, more pliable, and the bean is much bigger. 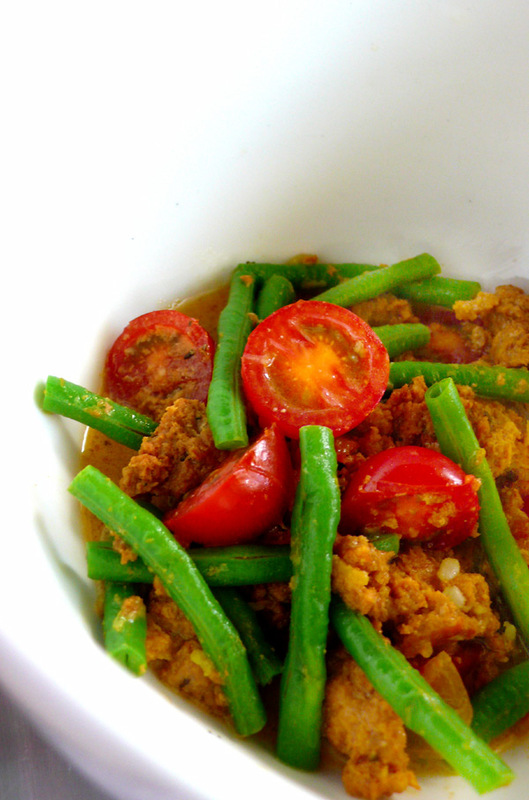 evil jungle prince has been successful in substituting french beans for long beans instead of green beans, so if you'd like to try this recipe, i'd go ahead and try the french beans in their stead. Oooh. I'm making this for dinner next week. Thanks. Mmmmm, looks very yummy! I didn't know there was a Sam Choy's in Guam. The dishes look very tasty. I wish he would make them here in Hawaii so I could taste them. mmm that looks soo ... yummy! Sounds like a total winner. I even think I could coax Ed into eating beans prepared this way. Thanks for the recipe! I've always wondered how restaurants keep their beans so green..thanks for the great tip! Sounds delicious and I want to try it, but I as I am in Boston I think I might have trouble finding achote. Is it necessary? I saw in the post earlier that you said the achoted doesn't add flavor, only color. Is there a mainland substitute I can use?